As part of small talk month, Charlotte Ellis shares her thoughts on the art of making small talk. Charlotte lives in Oxford, UK and works as Marketing Executive at Macmillan Education. 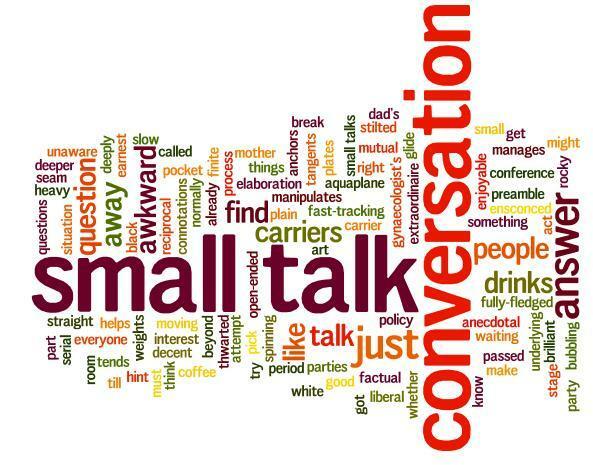 Small talk hasn’t got brilliant connotations, has it? You don’t have to make small talk with people you like or know – that’s just called ‘talk’. 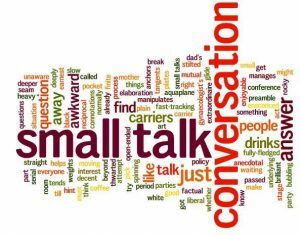 Small talk is the art of fast-tracking beyond the awkward situation in which you find yourself: whether it’s a slow moving drinks party, an earnest conference coffee break or the gynaecologist’s waiting room. At parties it tends to act as the rocky preamble to a decent conversation. Some people, the conversation carriers, can just do it. They glide you through the normally stilted question and answer period and aquaplane you straight to the good part. They pick up on a pocket of mutual interest and you’re away. Then there are the small talk anchors – the heavyweights who don’t get it’s a reciprocal process but answer your questions in plain black and white. There is no elaboration or anecdotal tangents that might hint at an underlying conversation seam – just a finite and factual answer to an open-ended question. And right there the conversation carriers’ attempt at something deeper is thwarted and they must try again. My mother is a conversation carrier extraordinaire. She manages and manipulates serial small talks like spinning plates till everyone is bubbling away and they find themselves deeply ensconced in a fully-fledged and enjoyable conversation – unaware they have already passed the awkward ‘small talk’ stage. I think my dad’s liberal drinks policy helps things too. I like small talk as long as it doesn’t get evil – a touch of irony won’t waste anything as long as it doesn’t turn into sarcasm..i use small talk to talk about people i know (and mostly it’s people i love, like my family or friends) and to express my emotions when i’m cross or when i’m happy, or to say what I think and give an opinion. I don’t like people who don’t let others talk, but I don’t like double-faced people who say horrible things about other people. I don’t condemn small talk as a general rule, but I think if you’ve got real thoughts you should perhaps address the right people. Conversation, to me is different, you can converse with anyone whereas you have small talk with people you know well. Charolette–I love how you describe both the small talk anchors and how your mother manages small talk in a group like spinning plates. The heavy weights can be real conversation killers. If I get the sense that they really don’t want to talk with me, I will graciously back out of the conversation. However, if they simply lack conversation skills, I’ll try a little harder with the open-ended questions, “tell me about that” extensions and interjections that encourage them to tell more because I am interested. I’ve also found that friendly, open body language (pleasant expression, leaning in a bit, mirroring them subtly). Good tips for how to deal with the conversation killers of the world – thanks!